Your home is your sanctuary, and any time it’s breached by unwanted guests it’s annoying. Insects and pests can quickly become a nuisance, and that’s why it’s important to be vigilant in getting rid of them as soon as you spot one. That’s why we’re sharing eight ways how to get rid of ants in the house quickly and easily. There are many home remedies for ants inside your home that you can turn to instead of calling an exterminator. Fire ants can be a particularly tricky type of ant to get rid of because you need to kill the queen to destroy the colony. However, with these DIY tips and techniques, you can save money while getting an ant infestation under control. These eight methods will help you eliminate the entire colony, so your home with be ant-free in no time. One of the best ways how to get rid of ants in the house and keep them out is to practice proper sanitation. You also want to find the entry points where the insects are coming in and eliminate them. This could vary by the ant species, but you should look for small holes, anthills, or structural damage to wood. Seal all entry points, though depending on the type of ant you have, you might not want to do this until you’ve made sure you’ve killed them all. Some types of ants, like carpenter ants, have to be killed at the source, so sealing up an entry point before you’ve dealt with the ant colony might do more harm than good. Make sure you keep your kitchen counter free of crumbs and clean up spills right away. It’s also good to keep any edible items you want to leave out of the cupboards sealed in airtight containers. This is especially important if you have cats or dogs, as fending off ants around pet food is a significant pest control issue that you can efficiently manage. Make sure you don’t have any open water. 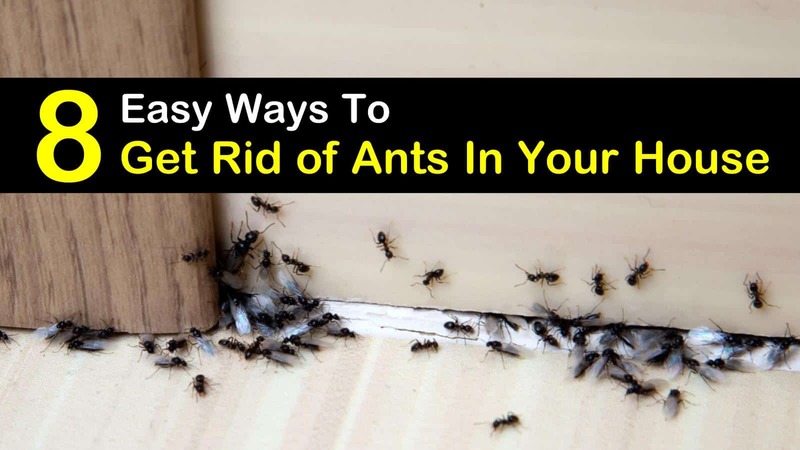 The most straightforward and most proactive of all home remedies for ants inside is to eliminate their water and food sources, so they don’t want to be in your home in the first place. As soon as you notice these insects in your house, you need to put together some homemade ant traps. Boric acid is a great ant killer and is a great ingredient to include in any trap. It kills ants from the inside out once they ingest it, and it is excellent for targeting entire ant nests. Most ants will take some of your boric acid-laced bait back to the nest, so you’re getting at the root of the issue without having to go searching for the colony. Combine boric acid, with water and sugar as liquid bait, and you’ve got the perfect mixture for an ant trap. Mix the ingredients in an old plastic jar or container. Poke holes in the lid and sprinkle some extra sugar on top and around the outside of the trap as a little extra incentive for the ants to check out your set-up. Place your homemade ant trap in any area you’ve noticed the pests gather — damp areas, cracks in the wall or floor, the kitchen counter, or any other place you spot them. If you have any pets or small kids, keep these traps out of their reach, as they may be sensitive to Borax. Diatomaceous Earth (DE) is a quick solution to your ant problem. This natural remedy is excellent for killing most insects, including spiders and cockroaches, and is as easy as sprinkling it in areas that ants gather. Food grade DE shreds ants from the inside once eaten and then dries the bodies out. If you are dealing with carpenter ants, you’ll need to sprinkle DE directly in the nest. You can put some of the dust into a medicine dropper and drop it into cracks close to their territory, or mix two tablespoons of DE to a quart of water to use it as a spray. This ant spray recipe is straightforward, cheap, and quick to make. All you need is some water and dish soap. The recommended ratio is 50/50, but this is not required. Or, if you have a little leftover soap in your container, add some water to it, and you’ve got an ant killer! Once mixed, you can either transfer it to a spray bottle to spritz around or pour some of the mixture directly on ants to kill them. This is an excellent solution to have on hand in the kitchen to use as often as you need. Once the ants are dead, wipe away the bodies with a paper towel damp with warm water. If you’re dealing with fire ants, then you can pour this mixture directly on top of the mound to kill the queen. Poke vertical holes in the hill to ensure the spray penetrates the soil. Ants can’t stand the smell of citrus, making both lemon juice and orange peels useful for ant control. Place your leftover peels near any entrance the ants might crawl through, or add a little bit of lemon juice to your cleaning solution when you wash the floors. Any citrus oils will work just as well. Remember to replace the peels or reapply the juice or oils every couple of days to keep the scent pungent enough to repel the ants. This method can be extra helpful if you’re dealing with odorous house ants, as the clean citrus smell will cover up any stink from this species of ant. Luckily, ants are attracted to many different foods — particularly things that are high in protein and grease — so they are easy to bait. Mix all ingredients and then dip the end of a straw into the mixture. Repeat until the straw is full of the bait and then cut it into ½ inch pieces. Place the bits of straw beside the ant trails or along the scent trails. Another excellent bait mixture is a combination of 70/30 powdered sugar and baking soda. The sugar acts as the bait while the baking soda dries the ants out after ingestion. As the mixture is pretty fine, this may be ideal for outdoor use instead of indoors. Ants detest white vinegar, so it makes a great ant repellent. Mix equal parts vinegar and water in a bottle and shake well. To add a bit of a kick (and make it smell better) you can add in a few drops of essential oils as well. Sprinkle the mixture in areas where ants might enter your home — along doorways, windowsills, and any cracks in the wall. To keep the scent potent, repeat this once a day. Ants also hate salt, cinnamon, and pepper — especially cayenne pepper. If you notice an ant or two around but don’t think you have a colony yet, then quickly whip out any one of these ingredients. Sprinkling salt, pepper, or cinnamon is probably the cheapest way to keep ants out of your home, and chances are you already have at least one of these items in your kitchen. Put a little bit of any of these powdery substances in corners, near cracks, along doorways or windowsills, and any other entry point ants might have into your house. Though this method won’t kill the ants or destroy a colony, they will help make sure you don’t get any more uninvited guests. Having ants invade your home can be a real nuisance, but luckily there are easy, natural, and cheap solutions to not only kill ants when you spot them but to keep them from coming back. Remember, it’s essential to stay on top of cleanliness more than anything if you want to avoid having these pests indoors, and you can also save yourself some trouble by monitoring the outdoor area around the perimeter of your house for any developing colonies. We hope that with these ant killing methods, you’ll have a pest-free summer! 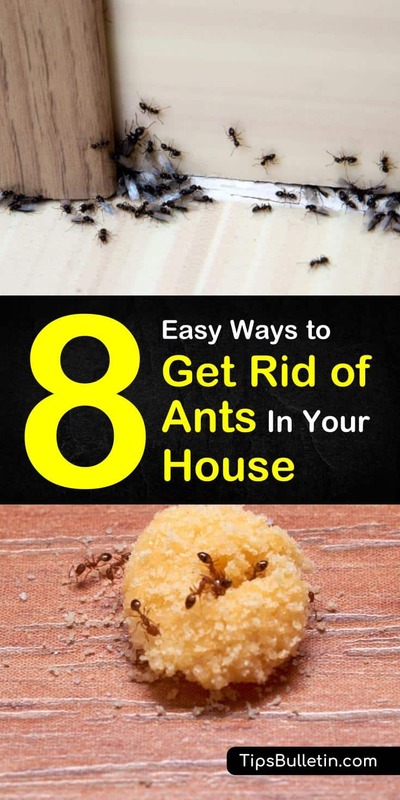 If you found these tips and recipes for eliminating ants in the house informative, then share our eight methods for getting rid of ants with your friends and family.